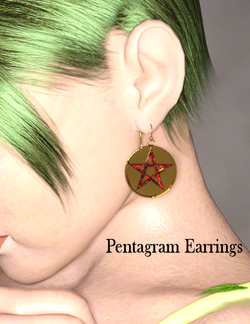 Pentagram Earrings for Poser is a set of disk earrings with a pentagram design, created by Chris Cox for Aiko 3, David 3, Hiro 3, Michael 1-2, Michael 3, Michael 4, Stephanie Petite 3, Victoria 1-2, Victoria 3, and Victoria 4. Chris Cox recommends using the surface setting files included in Stud Earrings for Poser when using these earrings in Daz Studio. This page was last edited on 12 June 2018, at 22:55.